We are excited to announce the launch of SafeNet Crypto Command Center 2.0, providing centralized crypto resource management of your SafeNet Hardware Security Modules (HSM) and securely reducing IT infrastructure costs on-premises, cloud, hybrid or virtual environments. In addition to a new and improved user experience, SafeNet Crypto Command Center 2.0 can now manage your crypto resources in private and public (AWS) clouds. Enterprise and service provider IT security departments can quickly and securely expand crypto management capabilities and streamline their infrastructure. This is the market’s first solution to fully exploit the benefits of virtualization including reduced costs and innovation, by provisioning SafeNet HSMs without compromising security or compliance. Network attached HSMs can be partitioned in a manner that makes a single appliance behave as if it is many appliances with cryptographic keys kept secure from other partitions. The result is that a single appliance can serve many lines of businesses and applications at once, while the keys and ultimately data always remain in the control of their rightful owner, even in multi-tenant environments. Together SafeNet Crypto Command Center and SafeNet HSMs combine to form one complete, centralized solution for the management of your crypto HSM resources – a crypto hypervisor. Deliver on-demand, elastic key vaulting and encryption services for data protection in minutes instead of days. In order for you to experience the benefits first hand and to facilitate testing, we have introduced a Freemium trial edition in addition to the full-production Premium version. See how you too can benefit from SafeNet Crypto Command Center by testing out the Freemium license in a non-production environment. Encryption as a Service / Hosted Service Provider Support: Securely manage crypto resources for a variety of organizations, departments and customers using the same SafeNet Crypto Command Center infrastructure. Multi-tenancy concerns around role separation and crypto isolation are addressed providing efficiency, stability and reduced downtime. Scalability and Lower Total Cost of Ownership– Dynamically spin up and down crypto resources, scaling your solution to meet current and future business requirements as demands increase and decrease. Highly scalable to manage 1 to 1000s of Luna HSMs. Route to cloud – For the first time, high assurance encryption services fit the cloud operations model, providing full control of crypto resources for data center consolidation and cloud migration. Support is offered for virtual appliances through a cloud HSM on AWS. Single, centralized platform – Improve operational efficiencies and ensure business continuity through the management and monitoring of one to thousands of SafeNet HSMs from one centralized location, in minutes not hours. Easily configured for High Availability (HA). Enhanced Security – Crypto templates contribute to the standardization of compliance driven policies, ease of use and automation, significantly reducing the risk of errors and gaps in your security. Additionally, increase the robustness of your solution through granular separation of duties so only application owners can see the crypto resources associated with their own environment. 2. SafeNet Crypto Command Center Freemium License: To ease testing efforts, Gemalto offers a free trial version so that you can sample first-hand what SafeNet Crypto Command Center 2.0 has to offer. Note that Freemium crypto services can only be created in a non-production environment and cannot be migrated to the Premium version. 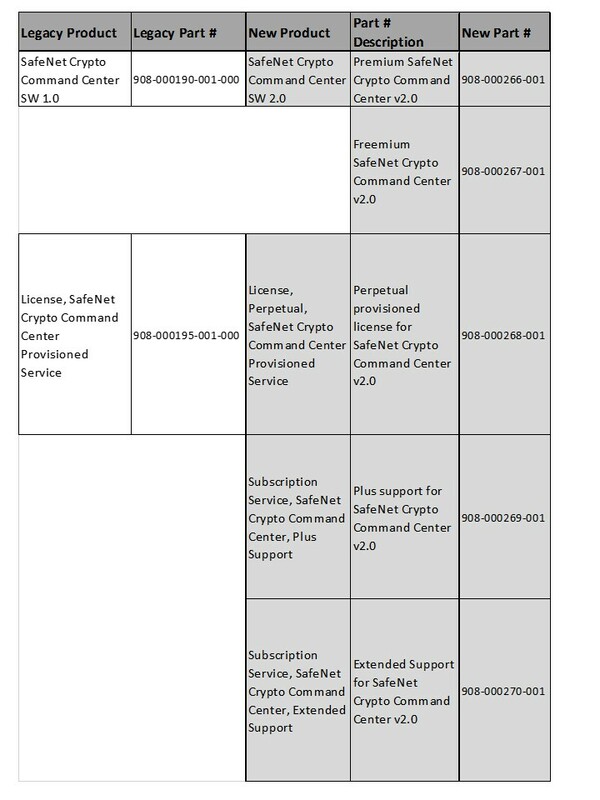 SafeNet Crypto Command Center supports the following versions of SafeNet Luna SA HSM: v 5.2, 5.3 and 5.4. Additional versions will be supported with the next release scheduled for Q4/2015. Please contact your SafeNet Sales representative or the Gemalto Support Team for additional product and migration information.